A dynamic outreach initiative inspiring and activating underrepresented youth to pursue STEM / STEAM career pathways. WHAT? #STEAMtheStreets is a national public outreach campaign to bridge the diversity gap in the technology sector by inspiring the next generation of workforce talent through music, video, and exposure to STEAM career pathways. STEAM the Streets is a current initiative of Big Picture Anthems, a multimedia production company that produces hip outreach campaigns to impact youth. WHY? An estimated 9.5 million STEM/STEAM jobs will exist in the United States in 2018. Currently, less than 20% of college attendees are enrolled in STEM majors. At this rate, there will be more than one million of those jobs that will remain unfilled due to lack of qualified applicants. Many suburban districts are addressing this crisis by providing programs, but inner cities are still far behind the curve. Only 25% of U.S. middle/high schools have high quality computer science programs. Only 5% of employees at top tech. companies are Black or Hispanic. If this continues, there will be a vast underrepresentation of talent of color in our nation’s brightest occupations. about their society and their future and exposing them to the potential they have within the vast STEAM career landscape. 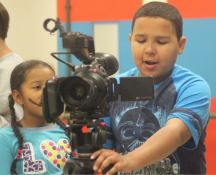 Our school outreach strategy is derived from two decades experience in engaging students through multimedia. 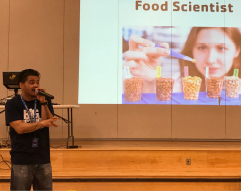 Led by passionate educator and DJ Angel Diaz, our school-wide assemblies engage students through a mix of dynamic video content, live performance, and interactive teaching. We use culturally relevant content to educate students about the vast landscape of STEAM careers. We coordinate classroom visits by diverse industry professionals sharing their story and occupation. Through these sessions, we aim to expose students to various STEAM careers and help connect academics to the real world. Our staff help curate the experience and facilitate a meaningful discussion with students. We provide in-school & after-school workshops that range from one time to throughout the year. >> Video production – Teach students to create profiles & music videos. >> Songwriting & Performance – We help students write, record, and perform songs with positive STEAM messaging. Final youth videos and performances are usually showcased at the assemblies where students can educate and inspire their peers. We produce profiles of diverse professionals who share their stories, advice and what they do in their careers. Our goal is to ultimately expose youth to hundreds of STEAM careers. Our Anthem about Black Inventors entitled “Black Made That,” involving 300 students from Richmond, CA & New Bedford, MA, has garnered 1.1 million cumulative views. 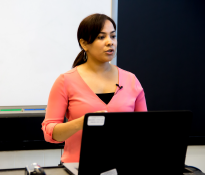 Educators across the country are using it to engage students around STEM & Black History. Within our “STEAM Powered” video series we’ve profiled STEM professionals of color from various companies including Adobe Systems, Pandora, and Pratt & Whitney. Along with a Youtube channel, we screen videos at school assemblies across the nation. Our in-school program @Carney Academy in New Bedford, MA is exposing and inspiring 5th graders! The program has boosted students’ connection & engagement with school assemblies, guest speakers from STEM fields, & after school arts & tech programs. For more in-depth exploration of our work, contact Ben@BigPictureAnthems.com. Boosted online reach for branded content via BPA Youtube channel, social media channels and email blasts. >> Donate and help us reach more youth! CLICK HERE TO DONATE – We appreciate your support! An expressive arts studio in Lawrence, MA providing a space to create, learn, grow, & enact change through the arts. A Kenyan NGO and UK charity using performing arts and community programs to inspire and deliver social change. The Leadership Brainery is a non-profit organization that serves as a pipeline program for first-generation and diverse college student leaders to gain access to leading graduate/professional academic programs. Our mission is to foster food justice and strengthen food security by creating sustainable and reliable access points and infrastructure that allow growers to sell, and consumers to buy, healthy, affordable, local foods.